Despite the many commons between Hong Kong and Taiwan cultures, there are small and interesting differences worth exploring. Anchoring effect or focalism is a psychology term referring to cognitive bias, where human usually overly relying on the first piece of information (the anchor), even that information is obviously irrelevant. Human tends to overly make use of the first information to decide quickly. Subsequent decisions making will then be based on the first decision made, and during which human will revise their cognition gradually. Nevertheless, to understand culture through art experience we are not trying to act like an archaeologist digging deep back to the past. Instead, through recognising the time limit we review and rethink on our current living environment. In other words, even wrong cognition to some extent represents a kind of truth that worth exploring and contemplating on. This is the first artist-in-residence experience for Walking Grass Agriculture (“WGA”) in Hong Kong. With our experience in art and in other residence programme, we tried to look at Hong Kong through certain topics we have long been paying attention to. We focused on the following phenomena during our field visit and investigation. The first one is to look at land problem through the lens of plantation. In Taiwan, even for its capital Taipei you will have a chance to find greenery in parks and on pedestrian islands. Wild grass that some are actually vegetables can also be found in some of the city corners. To have found these in Hong Kong is incredibly precious. While it might sound unrealistic trying to look for local agricultural product in Hong Kong, the plan for WGA’s stay in Hong Kong was to observe the red apple market in To Kwa Wan. Before we started, we were lucky to have visited the “The Day After Tokwawan” Community Living Approach Exhibition in Cattle Depot Artist Village, which gave us an overall understanding of the market. For the layout and architectural style, this is a modern market featured with comprehensive sewage treatment and waterproofing system. 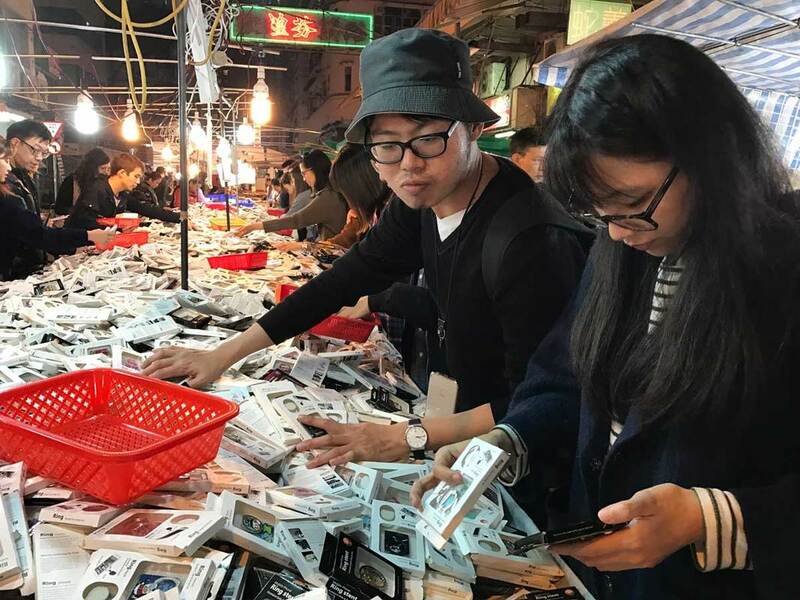 Most of the products are imported from Mainland China and they look just identical. Only slight “comprehensible” differences are discovered on some of the dried seafood, Chinese herbs and handmade food (such as dumplings and sweet puddings), barbecued food and fresh seafood. However, every impression turned around when Hong Kong artists brought us to Kam Tin, a place in Hong Kong between Taipo and Yuen Long. In Kam Tin, because it looks like Taiwan, the place is outstandingly different. It has changed our rigid impression of Hong Kong. Here one can find farmlands, interlocked black tile rooftops, and even intricately laid farmland footpaths and water channels. The visit has triggered our imagination on discussion of land issue in Hong Kong, and even shed lights to situation in Taiwan. 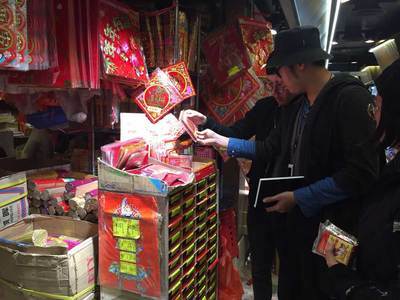 It was about time to Chinese Lunar New Year during our stay, so “Tung Shing” (a fortune-telling calendar based on lunar days) was everywhere. Tung Shing and the farmer calendar in Taiwan are basically compiled on the same concept. Originally, Tung Shing was called “Tung Shu”. However, the pronunciation of “Shu” can also mean “losing/lost” in Chinese and Cantonese. Thus in Hong Kong and Guangdong, everyone is calling the book “Tung Shing” instead. Both Tung Shing and farmer calendar, represent the concept of seasonal changes. It is a tool book to judge and choose the day of luck, as well as a book of experience accumulated by farmers. We are encouraged to start collecting Tung Shing in different Asian regions to start a new discussion in WGA. Secondly, based on the discovery on Tung Shing we extended our enquiry into local religion. In our experience in Taiwan, locations of temples and markets are usually geographically linked. Whenever WGA explores around a market, we deliberately look for temples that serve as the entrance of the market. In Hong Kong, we visited many famous and unknown, big and small temples, including those on Market Street, the Shing Wong Temple, the Kwun Yam Temple and the Tin Hau Temple. Through reading the temple stone tablet, we have learnt the changes of each place. While all the above temples are found close to the markets, we are deeply surprised by Sam Tung Uk Museum transformed from a Hakka walled village in Tsuen Wan. We could peep into the relationship between Hakka and Hong Kong through various cultural exhibits such as paper effigies, lion dance props and various Taoism ritual items, which felt like we were back home. The two different places, Taiwan and Hong Kong, are now linked up by the one common Hakka culture. The sound performance brought to us by artist Jaffa LAM and and her team during the opening ceremony also gave refreshing impression. Guqin, huqin and classic singing style with the help of modern audio mixing technique, created a space that transcends time, where dancers travelled in this ancestral hall. This is a rare experience even for us who are from Taiwan. Several exhibitions we visited in Hong Kong have encouraged deep thoughts, especially for “Poverty. Full-time” and “The Day After Tokwawan”. “Poverty. Full-time” was curated by Ducky TSE; organised by Oxfam HK, Outfocus Group Workshop and Quabitat, at the Jockey Club Creative Arts Centre (JCCAC). There were thirteen participating artists, including CHAN Hau-chun, CHAN Ka-hing, Luke CHING, HAU Siu-ching, LA Yat-nam, Joey LEUNG Cho-yi, Joe LI, LIU Ka-yee (Miss FAT), PAK Sheung-chuen with LH01, and Jonathan YU. At the same time, “The Day After Tokwawan“ took place at Cattle Depot Artists Village, under the Jockey Club “Blue House Studio” Cultural Heritage Education Programme. Invited exhibitors were So Boring, Kin Sang Ichiban, Kong Yeah, Wheel Thing Makers, Gwa Gwa Post, Ching Chun Warehouse and The Social Planning Institute of Hong Kong. Meanwhile, the organiser also called for proposal submission with 12 out of 25 submissions selected. The winning candidates had gone to the Museum of Contemporary Art Taipei and Bamboo Curtain Studio for an experience exchange on social participation. Many difficult problems emerge in Hong Kong under its highly intense population and social structure: because of politics and the economy the city is facing problems in aging population, housing tax system, labour right as well as education system. What are the perspectives in these two exhibitions that held at the same time in different locations? What are the respective art presentations of the exhibitions? “Some people are so poor. All they have is only a job.”, this is the subtitle of the art exhibition “Poverty. Full-time” that discusses the wealth gap phenomenon. The work of exhibitors mostly focuses on jobs taken up by the grass-root level, such as security guards, street sweepers and couriers. The exhibitors are trying to advocate for a reallocation of social resources and for an improvement of the work environment. To enter the exhibition, one has to walk across the atrium of JCCAC where you can find items used by the workers such as bloom, bamboo baskets and guard booth. Right at the exhibition entrance placed the work “Please give chairs to seceurity guards” (給保安員椅子運動) by Luke CHING. His presentation resonates with that used by conceptual artist Joseph Kosuth, and has raised an inevitable question beyond the exhibition theme: where is the place for art? When a piece of art is looking at social problems, it might not be trying to solve the problems, because it can be risky even to “arouse attention on poverty”. In reality, the problems and the viewers perhaps have no common ground. Only when it is under the domain of art will there be a chance for social problems (poverty) and viewers to stand on the same ground equally, to face off and question each other. WONG Shen-Yen’s (王錫欽) “The hermit-poet outside of a guard booth ” (《更亭外的詩隱》) recorded texts that can be seen when you are sitting in a guard booth. He extracted words to compile “the guard’s dictionary” and wrote poems using those words. Poems were painted in the shadow of the exhibit with invisible ink, awaiting viewers to discover with their ultraviolet torches. The effort to guard and monitor is now being honoured during search and discovery; it becomes the “profession” to be “obliged and performed” by the viewers. Behind every piece of art are hidden messages to be discovered. If one does not bother about it, he will not be able to understand fully. So isn’t art a process that requires effort? 13 streets is the name for the thirteen streets nearby the Cattle Depot Artist Village in To Kwa Wan. The neighbourhood bonding is extensively laid in the exhibition “The Day After Tokwawan“. For example, civil group Jik Jik Team offers an experience in fibre weaving. When we participate in the making of an art piece, we have created a sense of recognition for the place and become a member of To Kwa Wan. Hong Kong Polytechnic University has chosen the theme of “pulse check” in Chinese medicine to conduct their field investigation of 13 streets, through the four diagnosing techniques in Chinese medicine: to see, to listen, to ask and to touch. The result is a simple summary on the industrial structure, clan structure and population structure of To Kwa Wan. This is another kind of effort paid. To us, exhibitors of “The Day After Tokwawan” are facing problems beyond the search for an art form; can their proposals make a difference in the possible neighbourhood redevelopment in the future? Can they stop the incoming exploration and development? Regardless of the answer, they cannot stop; like education, we cannot stop just because we have an assumption in mind. The only driving force for those who carry on raising proposal is a selfless belief in the greater good. When they practise art, they are also educating others, and education requires effort. Two different exhibitions have coincidentally focused on the same object but have given their own perspective. Both reflected the urgent social problem faced by Hong Kong nowadays. No matter if the “proposals” and “objects” in the exhibitions are presented by exhibitors who regard themselves as artists or not, all these exhibited items would still be viewed in the same way in an exhibition space. Most exhibitions, that many are familiar with, showcase the art products. It is rare to have exhibitions showing only the process of events. Art is the yeast in society that brews events and the emotion of the viewers. An art exhibition constructs a temporary relationship between the labour and the viewer. When we collaborate and communicate with each other to raise proposals, we are trying to expand our imagination of the future. However, changing this cold society takes more than solely artists’ effort in cultural cultivation. “Some people are so poor. All they have is only a job.”. This is not just about poverty in life, but poverty in art and education. This perhaps is another question that worth contemplating in society. Walking Grass Agriculture (“WGA”) was established in 2016 by two members LIU Xin-you and CHEN Han-seng from Kaohsiung, Taiwan. WGA spells out their concern on natural environment and land issues through curation, design or artwork. The name “Walking Grass” is more than the analogy of a grass that walks; it is about promoting a way of living that pays close attention to our environment, just like how we spot out the unobvious small grass when we walk along the road. 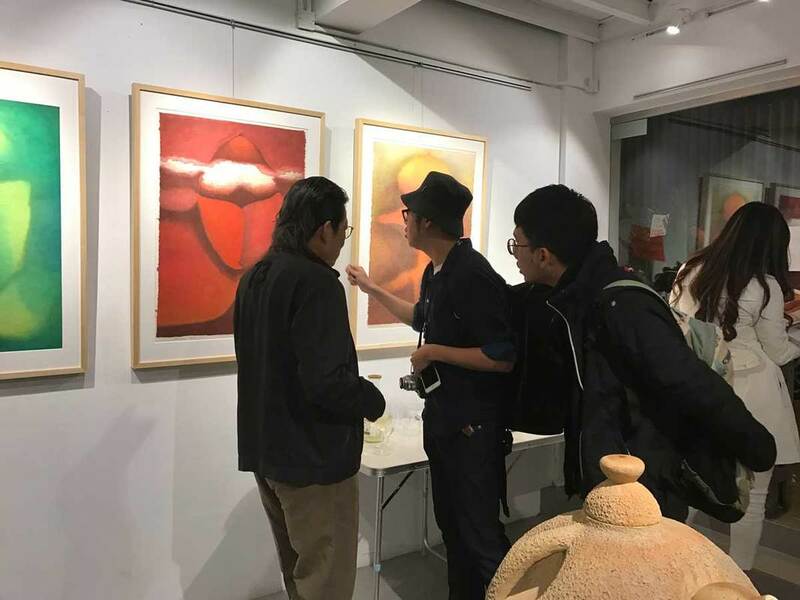 LIU and CHEN are both from farmer families; agriculture to them is more than the agricultural skills but direction for them to practice art they have learnt. They have a vision to “flourish a state through agriculture, intervene art through agriculture”. 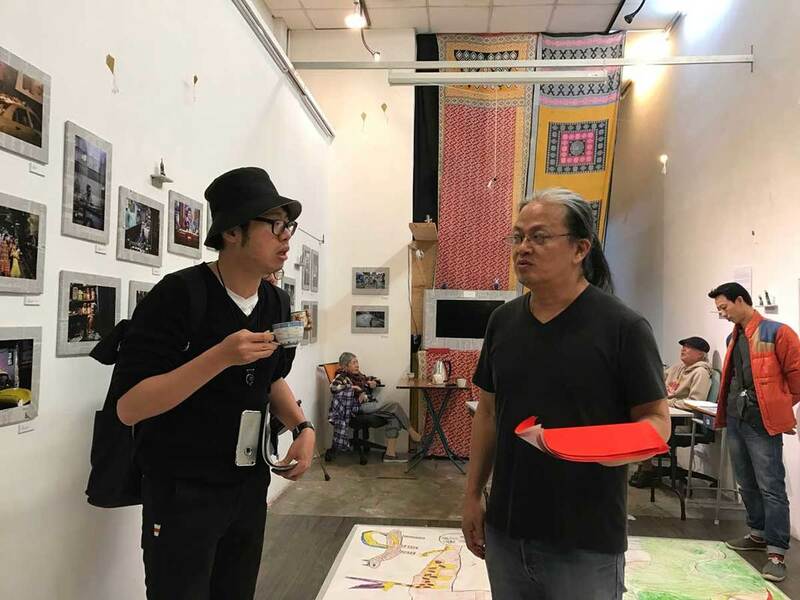 LIU’s academic background is in art history and he is mainly taking up the role of curator and art critic in WGA; meanwhile CHEN makes use of his visual communication design knowledge to create interactive installation and digital animation.